Notes: 1. This film, retitled The Demon's Shadow, is a 10-episode, 20-reel version of the 1914 serial Zudora, also known as The Twenty Million Dollar Mystery. The November 16, 1918 issue of The Moving Picture World announced that the editing would be done by Jesse J. Goldburg (who was associated with the Frohman Amusement Corporation). Distribution was on a states rights basis. 2. It was first announced that episodes would be released at the rate of one each week commencing with December 20, 1918. An advertisement in The Moving Picture World, January 25, 1919, noted that the film had been "on the market one week." However, this referred to the sale of the film to distributors; not to the availability of prints or to the release of the film. The release schedule was revised to February 20, 1919. The Moving Picture World, February 22, 1919, stated that the release date for the first episode had been moved forward to March 1st. In practice, release times were irregular, and sales were still being made to new territories many weeks after the March 1, 1919 date. 3. The cast of this film was the same as the original. Featured in advertising were Marguerite Snow and James Cruze. 4. 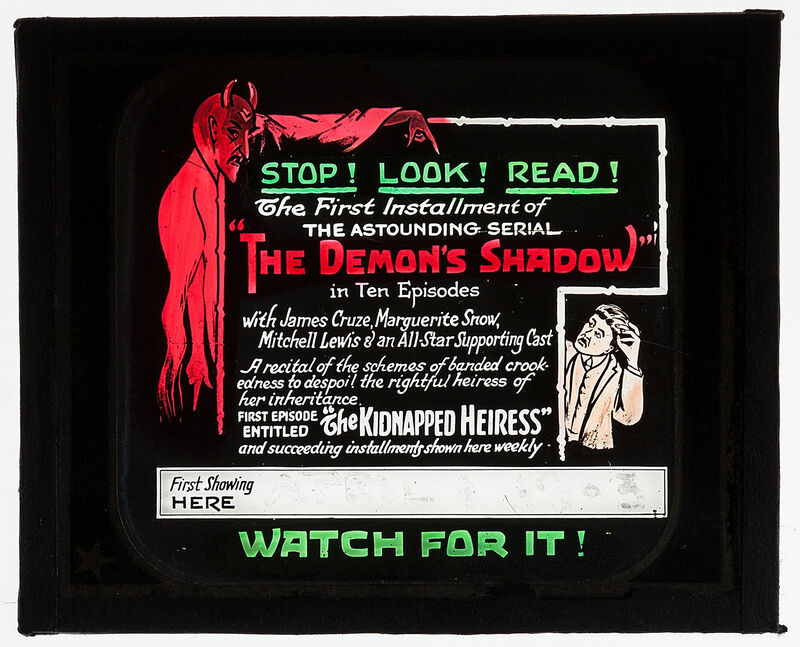 The title was first advertised by Arrow as The Demon Shadow, and then corrected to The Demon's Shadow. 5. An advertisement in the January 25, 1919 issue of The Moving Picture World noted that rights had already been sold for greater New York and Northern New Jersey, Eastern Pennsylvania and Southern New Jersey, Delaware, Maryland, District of Columbia, Georgia, Virginia, Florida, Alabama, North and South Carolina, Tennessee, and the six New England states. "...At the rate which inquiries are coming in the entire country should be disposed of within a brief period" the advertisement noted. "The Twenty Million Dollar Mystery - to be reissued in December 1918: After a quiet canvass among states rights exchanges the Arrow Film Corporation has determined to reissue in ten two-reel episodes The Twenty Million Dollar Mystery. The cutting and reediting is in the hands of Jesse J. Goldburg, and it is expected that the work will be completed and the first episode ready for delivery about December. The production will be states righted upon a basis which calls for the delivery of a minimum number of prints, instead of a maximum number, the production being sold on the basis of payment for the rights instead of on a footage basis." "Arrow reissues serial called The Demon Shadow: Following the announcement made in a recent issue that The Twenty Million Dollar Mystery will be re-released, the Arrow Film Corporation advises that the new title for this production, which is said to be the first serial ever reissued, will be The Demon Shadow. This serial, originally issued in 20 episodes, has been cut down to 10, and has been revised and re-edited. Each episode is in two reels, and Marguerite Snow, James Cruze, and Mitchell Lewis are among the principal players. "Concerning this production, Dr. W.E. Shallenberger, of Arrow, says: 'We have contracted with the Big Productions Film Corporation, the owners of the United States and Canadian rights, to distribute this serial on a states rights basis. The meat of the original plot is retained, together with all the original sensationalism, eliminating only incidents that today would not appear germane to the subject. Because of the faith of the producers in this reissued production, we are refusing to lease outright territorial franchises, but are distributing the serial on a percentage basis only. "'Reference will be prominently made to the fact that The Demon Shadow is reissue of The Twenty Million Dollar Mystery, but we are preparing advertising matter to accompany the production as though it were an entirely new release. Out-of-town buyers who called at our office during the past week have not hesitated to sign the franchises, and we have already closed for the following territories: Georgia, Florida, Alabama, North and South Carolina, and Tennessee to the Specialty Film Company, of Atlanta; Maryland, District of Columbia and Virginia to the Variety Pictures Corporation, of Baltimore; the New England states to the Federal Feature Film Company, of Boston; Greater New York and Northern New Jersey to I.E. Chadwick, of New York; Eastern Pennsylvania and Southern New Jersey to the Quaker City Feature Film Co., Inc. of Philadelphia. The Demon Shadow will be released one episode a week commencing December 20, and the advertising and trade magazines to run concurrently with the release.'" "The Arrow Film Corporation has concentrated on the press bulletin distributed in connection with a reissued serial, The Demon's Shadow. This production, as previously announced, is a reissue of The Twenty Million Dollar Mystery, originally distributed in 20 episodes of two reels each, and is said to retain all of the sensational and dramatic action that occurred in the original serial. "The press bulletin is of unusually large dimension, measuring 35 x 22 inches, being slightly larger than newspaper size, and is printed in red and black. In addition to articles on sales talks, sample ads, copies of cuts and general matter that goes into a pressbook, there is also a resumé of the 'punches' that appear in each episode. 25,000 copies have been ordered, with the idea of mailing one to every exhibitor in the United States as well as a copy to every newspaper in the country. The first episode of The Demon's Shadow is scheduled for release February 10."